1. 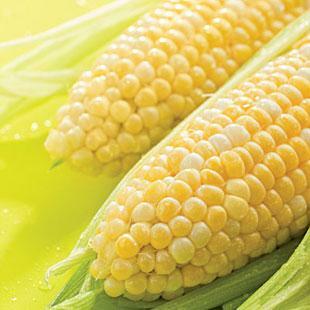 Corn: Nothing says summer like fresh sweet corn. And did you know that two antioxidants—lutein and zeaxanthin—in corn may act like natural sunglasses, helping to form macular pigment that filters out some of the sun’s damaging rays? It’s true. The same antioxidants may also help lower your risk of developing age-related macular degeneration—the leading cause of blindness in people over the age of 60 (though much of the damage occurs decades earlier). 2. Iced coffee: An iced pick-me-up is a great way to start your summer mornings. Better yet: drinking a single cup of coffee daily may lower your risk of developing skin cancer. In one study of more than 93,000 women, published in the European Journal of Cancer Prevention, those who drank one cup of caffeinated coffee a day reduced their risk of developing nonmelanoma skin cancer by about 10 percent. And the more they drank—up to about 6 cups or so per day—the lower their risk. Decaf didn’t seem to offer the same protection. 3. Tart cherries: They deliver a host of health benefits. You may have heard that drinking tart cherry juice can help you get a better night’s sleep and quell post-workout pain (read more about that here). But did you know that compounds in tart cherries may also help you slim down and get leaner? When scientists at the University of Michigan Health System put rats on a high-fat diet supplemented with either a tart-cherry powder (equal to 1% of the weight of their total diet) or the same number of calories from carbohydrate, those that got the cherry powder gained less weight and body fat. Why? The anthocyanins in tart cherries activate a molecule that helps rev up fat burning and decrease fat storage. 4. Tomatoes: There’s no question that sunscreen should be your first line of defense against the blazing summer sun. But eating tomatoes could give you a little extra protection: consuming more lycopene—the carotenoid that makes tomatoes red—may protect your skin from sunburn. In one study, participants who were exposed to UV light had almost 50 percent less skin reddening after they ate 2½ tablespoons of tomato paste (or drank about 1&frac23; cups of carrot juice daily), in addition to their regular diet, for 10 to 12 weeks. Supplements, however, weren’t as effective: in the same study, those who received a lycopene supplement or synthetic lycopene weren’t significantly protected against sunburn. Related: Do You Really Need 8 Glasses of Water a Day? 6. Raspberries: Raspberries are a great source of fiber—some of it soluble in the form of pectin, which helps lower cholesterol. One cup of raspberries has 8 grams of fiber—and a study in the Journal of Nutrition suggests that eating more fiber may help prevent weight gain or even promote weight loss. Over the course of a two-year study, researchers found that when study participants boosted their fiber by 8 grams for every 1,000 calories, they lost about 4½ pounds. Try it for yourself. If you’re consuming 2,000 calories per day, aim to increase your fiber by 16 grams. Find 5 more fiber–rich summer foods that do the weight–loss work for you here. 7. Iced tea: Sure, a tall glass of iced tea on a hot day is refreshing, but did you know it might also do your body good? Studies show if you drink tea regularly, you may lower your risk of Alzheimer’s and diabetes, plus have healthier teeth and gums and stronger bones. How? Tea is rich in a class of antioxidants called flavonoids. Regardless of the variety—black, green, oolong, white or herbal—maximize the power of tea’s flavonoids by drinking it freshly brewed. If you want to keep a batch of cold tea in your refrigerator, “add a little lemon juice,” recommends Jeffrey Blumberg, Ph.D., director of the Antioxidants Research Laboratory at the USDA Human Nutrition Research Center on Aging at Tufts University in Boston. The citric acid and vitamin C in that squeeze of lemon—or lime, or orange—help preserve the flavonoids. 8. Blueberries: Fresh blueberries straight from the berry patch are a special treat! Turns out the antioxidants in them may help ward off muscle fatigue by mopping up the additional free radicals that muscles produce during exercise, according to recent research out of New Zealand.